The images on this website were taken by Will & Matt Burrard-Lucas. 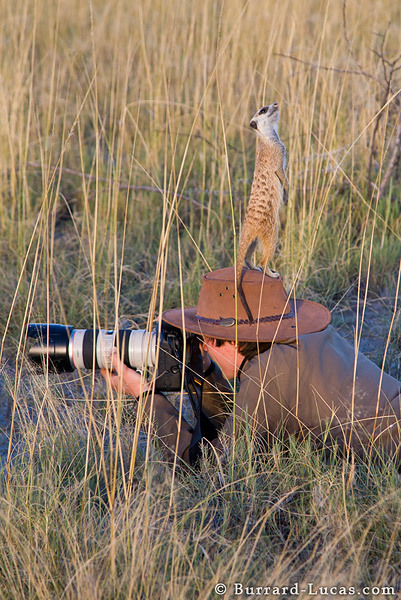 In 2008, we visited the Kalahari Desert in Botswana to photograph meerkats in their natural environment. Near Jack’s Camp, on the edge of the Kalahari, there is a group of meerkats that has been habituated to humans over many years. These meerkats go about their daily lives, completely unperturbed by human visitors. 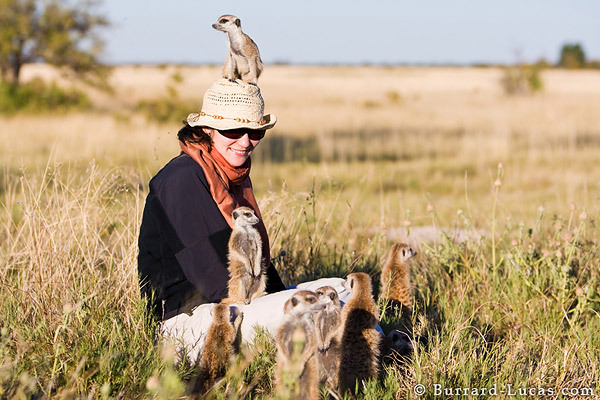 In fact, the meerkats have come to view people as handy lookout towers and will sometimes climb on top of you to get a better view out over the long grass! This was therefore a fantastic opportunity for us to get close up, intimate photographs of meerkats in the wild. We visited the meerkats several times in order to document different aspects of their lives. In order to get as many different photos as possible, one of us concentrated on using a wide-angle lens while the other used a telephoto lens. The meerkats were very cute and the time we spent with them was wonderful! We can’t wait to one day return to the Kalahari Desert to take more photographs of these amazing little creatures.